I was driving passing by a hotel last week and saw a large billboard announcing the arrival of Mother's Day. Mother's Day already? Immediately my eyes became watery and my heart felt heavy. It has been more than 12 years my mum left us, but, the sadness i felt every single time i thought about her made it seemed just like yesterday she went away to meet her Creator. Absolutely true, don't you think? Ask any mother and they could tell you tens of stories of the difficulties and harship they faced bearing their babies for 9 months, then, the hours of labor they went through, plus having to put up and tolerate the years and years of their children (aka us! )whining and complaining while raising us up! Yes, those are just a few examples among the hardships they had to endure just to see us grow into a full blown person! But i realized something too. In all those stories they relate to us, there is definitely one kind of hardship they rarely talk about. Are you curious what it is? It is the challenged melting all the extra pounds they gained while eating healthy and nutritious food all for the sake of their little darling fetus in their wombs! Yikes! Guess walking is definitely not for everyone, huh? So, i asked a friend of mine, Jason Moriarty who owns an All Ladies Club Fitness Gym, called Tropic's Fitness about shedding off the pounds for new mummy. So you have just delivered your little pride and joy after nine months of carrying theme around. Now you look down and wonder where you waist line went, and decided it is time to get back in shape. Most new mums are worried about how much they have gained over the nine months and feel that they must be the mum that gained the most weight ever. recommendations go as high as 40llbs depending on pre pregnancy BMI. good news is the last 5llbs or so. Do not worry to much as some regular exercise will help to get rid of the this. Providing you have had a normal delivery it is ok to begin exercising immediately, now I know some cultures require a month’s confinement for the new mum. You can still do some light exercise around the house. if you work out regularly you will see results. reduction in body fat over time. changes to lochia flow ( vaginal flow) pink or red. shy ask if they have experience of working with women after birth. strength training programme typically 12 to 14 exercises. So, for the ladies out there, there you go! And if light exercises still is not your cup of tea, perhaps you would like to try what Randy Glasbergen suggested here! Thank you for calling the Weight Loss Hotline. If you'd like to lose a half pound right now, press 1 eighteen thousand times. Wait! Are you kidding me? (Note: Jason Moriarty is the CEO of Tropic’s Fitness. After over 17 years in the fitness industry, Mr. Moriarty has created his own fitness company, Tropic’s Fitness – a unique, ladies’ only gym that offers a friendly and supportive environment for women to improve their lives and health. Jason a British Graduate, in Business and Finance went on to study gymnasium management; he is also a graduate of the American Council of Exercise and a Nautilus Master Trainer. Prior to moving to Asia Mr. Moriarty was a business manager for Serco Plc. a leading publics listed company company. Providing cost effective solutions for the management and growth of Government facilities in particular the leisure sector. Moriarty has also provided consultation and training for a number of prestigious companies such as Serco PLC. Raffles Hotel Group, Sheraton Imperial, Grand Hyatt, Celebrity Fitness, Gold’s Gym Inc.
sorry about ur mom...May Allah bless her...dont be sad dear,u have us to lighten ur days! 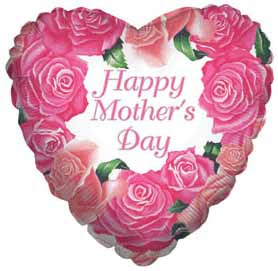 happy mothers day to all mothers in the world!!! 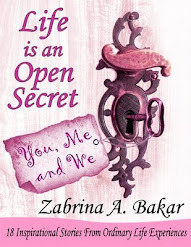 Sister Zabrina I have read your blog for awhile now and I just wanted to let you know that I appreciate what you do. May Allah Reward You for reminding us of the things that really matter! thanx sis for continuously remind me with ur writing..This is 1 of my favorite blogs..May Allah bless you..
p/s : i've bought ur book and its great! Dearest sis Anonymous,Ameen to your prayers! And yes, you are very fortunate to still have your mother with you sis. Appreciate her while our Lord still allows you the time. May you and your mum love each other for eternity, ameen. Salaams Sis Zayna, Ameen to your prayers. I have visited your blog too and i absolutely love the content! I think a lot of women would love to know how you 'did it' so successfully too! I have never lost that much weight in one week. One thing for sure, you are wondrous commitment and self-restraint! Bravo sis! p/s Could share share with me a tip or two? Salaam Sis Saidah, JazakAllaah khayran for making Life Storyteller Blog one of your fav blog! 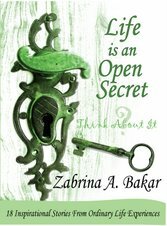 'We' are truly honored and jazakAllaah khayran once more for getting your copy of Life is an Open Secret. InshaAllaah, i pray that it benefited you, and if it does, please do tell others about it, inshaAllaah! Hope to see you here more! I have something worth to see in my blog. Seriously. I am not promoting but passing the message to you all. Please download a file from my latest entry. Thanks in advance for your belief. Your blog is interesting :) Keep it up! Dearest Sis Khawla, JazakAllaah khayran dearest sis! I am glad to know you liked it here. Do come often as we have loads of sharing going on here, inshaAllaah!